I received this product in exchange for my honest review. I was not required to write a positive review nor was I compensated in any other way. All opinions expressed are those of my own. 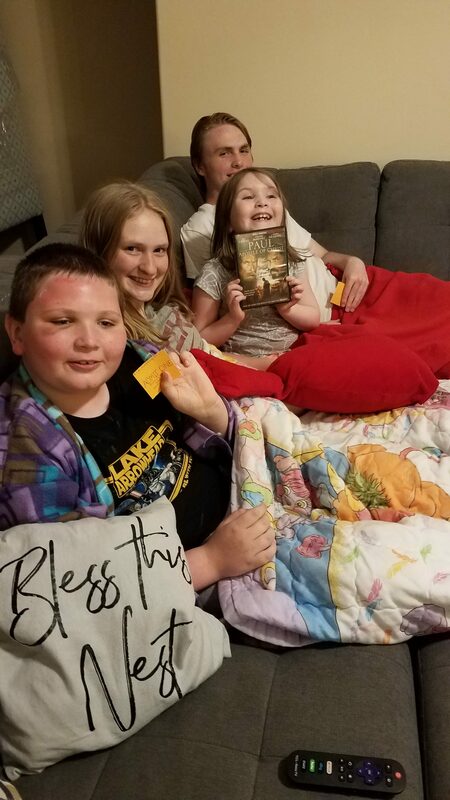 Last night our family was looking forward to FINALLY having a movie night together. 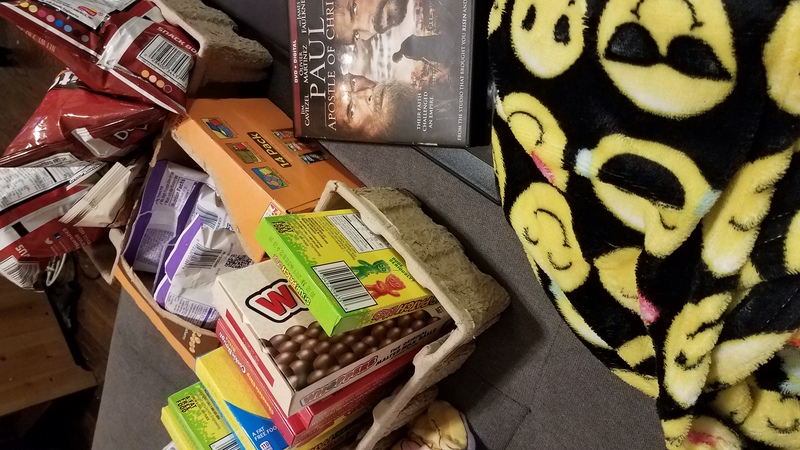 We were all together under one roof and ready with our snacks when we sat down to watch Paul Apostle of Christ. 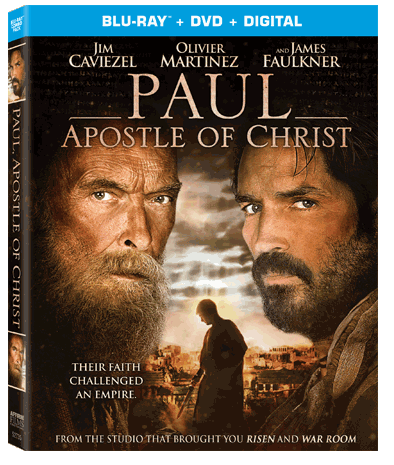 Paul (Faulkner), who goes from the most infamous persecutor of Christians to Christ’s most influential apostle, is spending his last days in a dark and bleak prison cell awaiting execution by Emperor Nero. Luke(Caviezel), his friend and physician, risks his life when he ventures into Rome to visit him. Paul is under the watchful eye of Mauritius (Martinez), the prison’s prefect, who seeks to understand how this broken old man can pose such a threat. But before Paul’s death sentence can be enacted, Luke resolves to write another book, one that details the beginnings of “The Way” and the birth of what will come to be known as the church. Their faith challenged an empire. But their words changed the world. Soon after turning on the movie thought we may have made a mistake by letting our 7-year-old watch with us. My tired brain didn’t consider the fact that persecution would include torture and execution, but it remained over her head and we had no issues. As for the rest of us, we quickly fell in love with the film. The story is true to both history and scripture and was enjoyable. My husband and I were both pleasantly surprised with the humorous quips between Paul and Luke, showing that they were human while yet men of God. The end, oh my word, the end left me in tears. One great factor of this film is that you do not have to be a theology scholar or history buff to understand and appreciate what is happening. One could even press play on this movie, having never heard of Saul/Paul or Nero, and follow along as it explains it all so well. That being said, if you do enjoy these things, you will find it especially interesting as well. Two of my favorite “characters” were Aquila and Priscilla, and seeing what they might have been like was really neat. 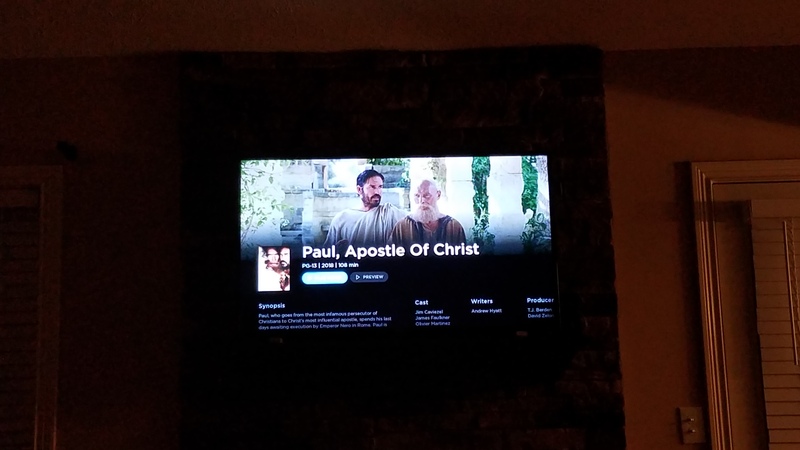 The Schott Family highly recommends Paul, Apostle of Christ!!! We also highly recommend discussing what is happening with your children so that they understand what persecution is and what it meant for those that have to endure it, even now. It is probably best to screen the film before allowing your children to watch to know if they can handle some of the scenes or not. (Example: There are Christians that were used as Roman Candles to light the streets. This was seen several times in the film.) Even so, we give the movie 5 out of 5 stars! For more information, follow this movie on Facebook and Instagram! Are you interested in winning a copy for your family to enjoy? Alternatively, you can go to https://www.blessedfreebies.com/paulapostleofchrist.html to enter as well. Have you seen this movie? What did you think? Let me know! 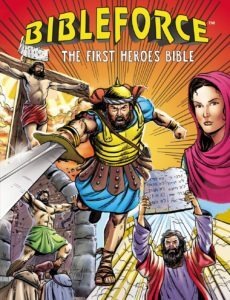 I’m going to just say it right off the bat… If you have a child that loves comic books, you are going to love BibleForce. 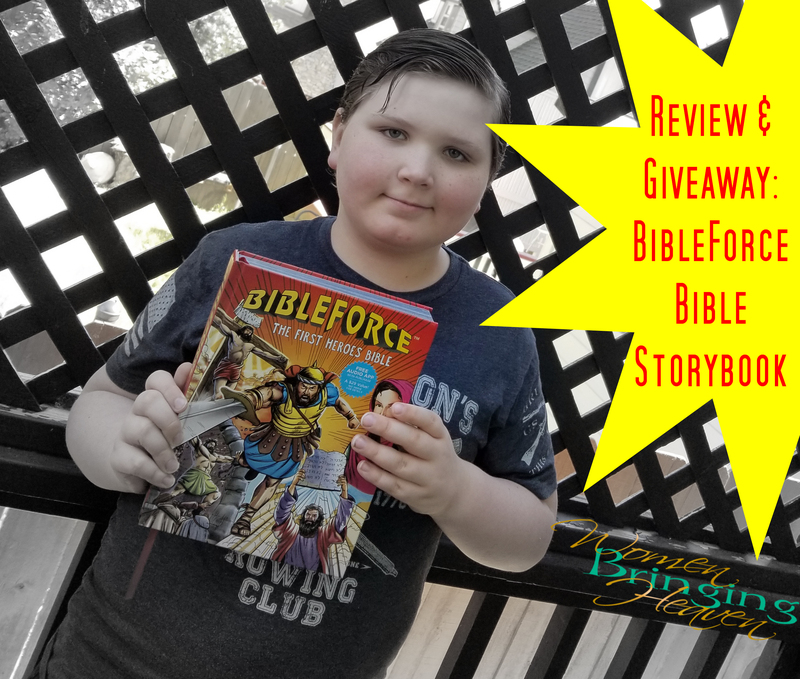 Our family has been reading BibleForce and I have one particular child, Tommy (age 10), that has fallen in love with this book. Since putting this book in his hands, all he wants to do is read. He especially loves the free app that comes with the book that helps him read along through stories with particularly difficult words for his reading level. 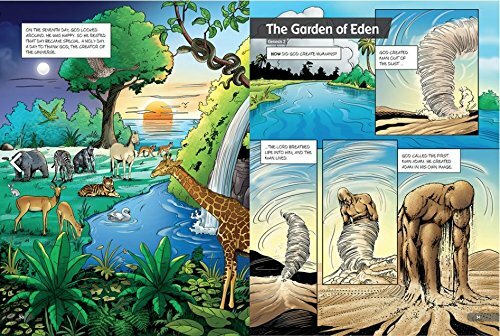 It does not seem that much has been left out of the Bible when translating it into a comic style storybook! The book itself is very thick and somewhat heavy. There are pages with history, maps, and even “Hero Profiles” that state facts on different heroes of the Bible. Hero Profiles were one of Tommy’s favorite features as he loves to learn facts. I love that it has my child interested in Bible heroes, reading, and looking up scripture in the Bible to see what more he can learn about the hero and story he has read about. In fact, a few times we have had to go in and tell him it is time to put the book away to go to sleep/do chores/eat/etc. If you are a parent of a reluctant reader, you know how excited this has made me. I’ll be honest, we have a lot of different Bible storybooks. I didn’t expect this one to be too much different, but I have been pleasantly surprised with the way it has ignited a fire in my son. 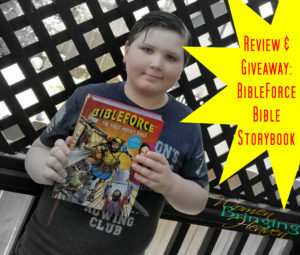 Our family highly recommends BibleForce! 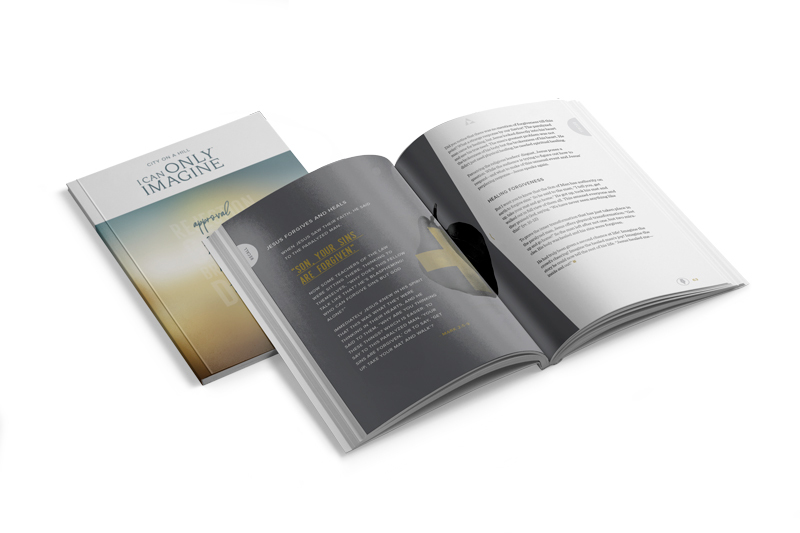 Are you interested in entering a giveaway to win a copy of your own? You can do that here! By now many have seen the movie I Can Only Imagine. Unfortunately, even with the best-laid plans, I have not. That did not stop my husband and me from enjoying the I Can Only Imagine Small Group Curriculum though. 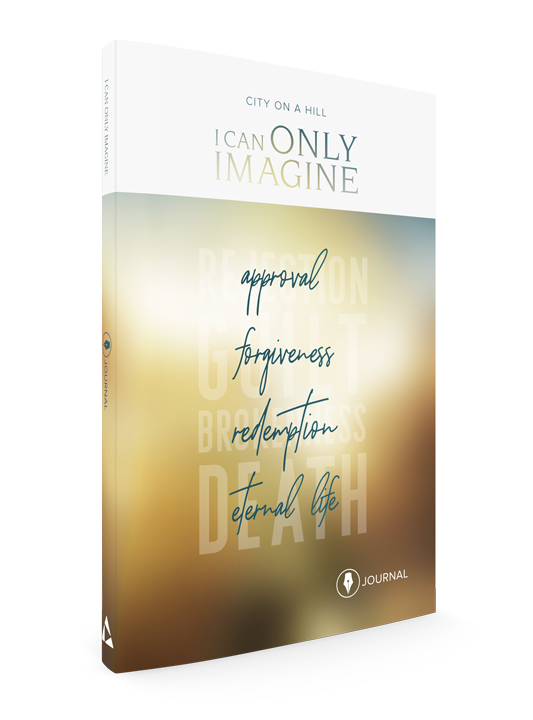 For this review, I was supplied with the 28 Day Study Journal, in which, through studying the life of Jesus, a week is spent on each of the topics Rejection/Approval, Guilt/Forgiveness, Brokeness/Redemption, and Death/Eternal Life. Also included was a leather journaling notebook and a DVD containing a series of 4 episodes, one for each week in the study, to be watched as a group. The 28 Day Study Journal was well laid out and didn’t leave you feeling lost or as if you missed something. 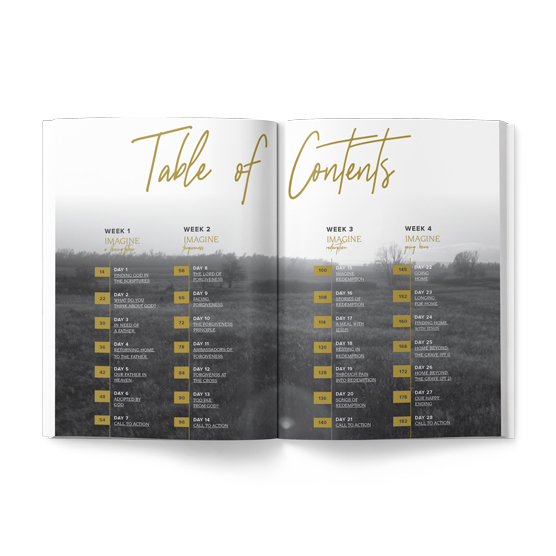 Including scripture, quotes, questions, and even hymn lyrics, it assists you in digging into the hidden places of your heart to allow God to heal your brokenness and move forward. The DVD was exceptional and really got us talking about how we related the topics to our own lives. 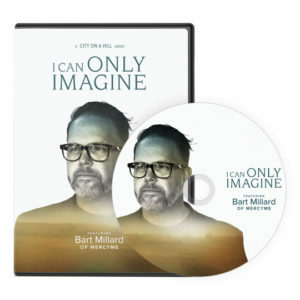 Bart Millard shares raw emotions about his life story and how, with God, his life, the life of his father, and their relationship was redeemed. As for the journaling notebook, much like the other products, there was nothing left wanting. While blank, the pages were well laid out with pages for various types of journaling and the cover very sturdy. Let’s face it, in this day and age (well, any day and age) there is no one that has not experienced hurt. 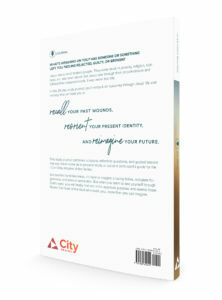 These products by City On A Hill make a great tool for discovering your identity in Christ while becoming whole in Him. Taking it a step further, and doing that as a group, really helps as you know that you are not alone in having gone through these emotions. 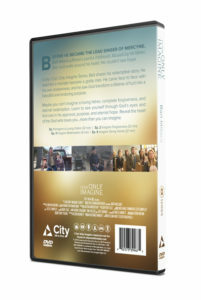 Have you seen the movie or tried the Bible Study series? I’d love to know what you thought of them! Sometimes during the day, we need little reminders of God’s love and faithfulness to keep us going. Prone To Wander LA is a company that is focused on helping you do just that. Each product displays a scripture, Biblical promise, hymn lyric, Godly greeting, or something similar. A few weeks ago I received a beautiful banner and pillow cover in the mail. First of all, I have to say how amazing these items smelled when they arrived. I kept holding the packaging and items to my nose because they seriously smelled SO good! Sometimes, when you order something online, it arrives smelling unpleasant so this was nice. 😉 Second, I was amazed by the quality! Being someone that sews, unintentionally, I look at things like seams, creases, and zippers. These products are not only aesthetically pleasing to the eye but are constructed to last with durability. The fabric is top notch and the seams are strong. But most of all… It has been wonderful to see this banner as I walk through my home or on my way out the door and find myself humming or singing “Be Still My Soul” as I go about my life. I have had a rough couple of weeks and to remember the Lord is on my side has meant so much to me. The pillow rests on my couch and when my kids are being silly with a mess on the floor I remember that even amongst the toys, my nest is abundantly blessed. It’s the little things sometimes, more than the big things, that bring the most reassurance of His love for us when we need them. 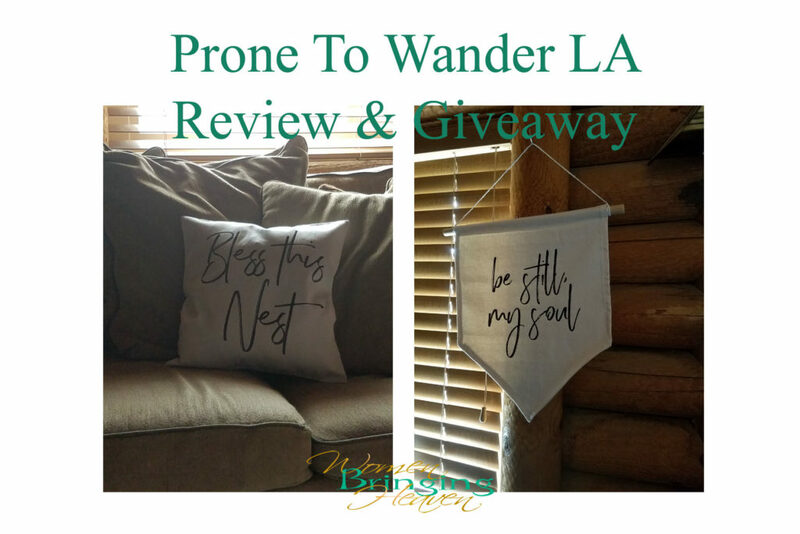 If you are like me and enjoy little reminders of God’s love and faithfulness throughout the day, but also prefer that these items be of higher quality, I HIGHLY recommend making a purchase from Prone To Wander LA. Also, there is a giveaway! Prone To Wander LA also offers phone cases and are giving away a set. Enter now for a chance to win! Fill out the form below or go to this link to enter. I love music… Especially worship music. I seem to not be able to do anything without it playing in the background. It just brings motivation and encouragement to everything I do. Knowing this, I jumped at the opportunity to review the new debut album from Higher Vision, For Your Kingdom. Higher Vision Church is located here in Southern California and is quickly growing, averaging about 3,000 attendees each week from all walks of life. 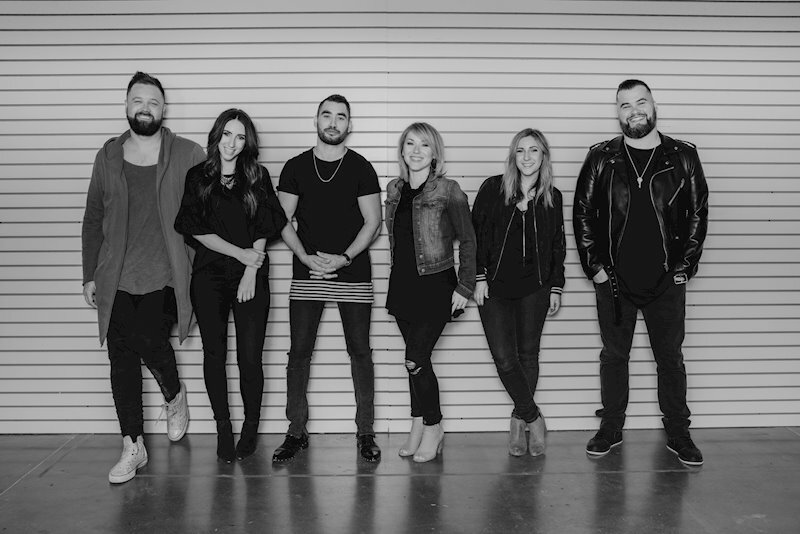 Their worship team sings some of their own original songs, and now has released an album. With a sound that some would find similar to Hillsong Young and Free or Elevation Worship but is also unique to its own style, this album does not disappoint. Each track seems to have a reference to scripture and doctrinal truths, leaving no room for fluff. A perfect mix of upbeat songs that would be perfect on your workout playlist and slower ballads that will help usher you right into the Throne room during your personal prayer time… or, if you’re like me, great to listen to as you drive, do housework, or sew and craft. Among the songs on this album, I have to say that my favorites were Trust In You (which anyone going through a trial would appreciate! ), We Cry Holy, and Broken The Chains. Worship leaders in modern churches looking for new music to add to their set lists would enjoy this album as well. How about a chance to win a copy? 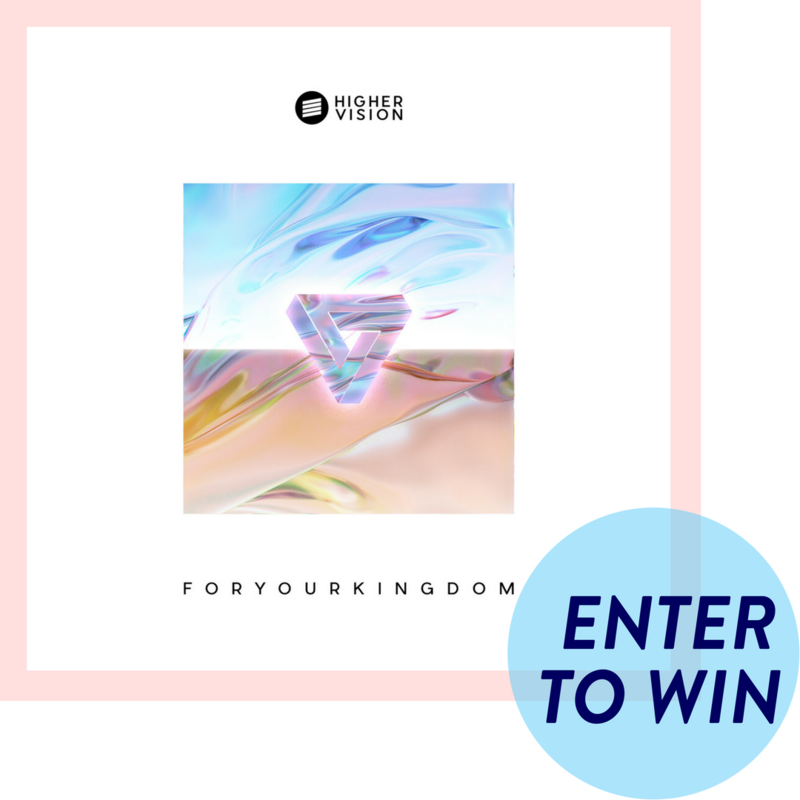 You could win 1 Higher Vision For Your Kingdom CD from Higher Vision and Frontgate Media! Follow this link here to find out how to enter: Click HERE! Have you listened to this album yet? Tell me what you thought about it in the comments! 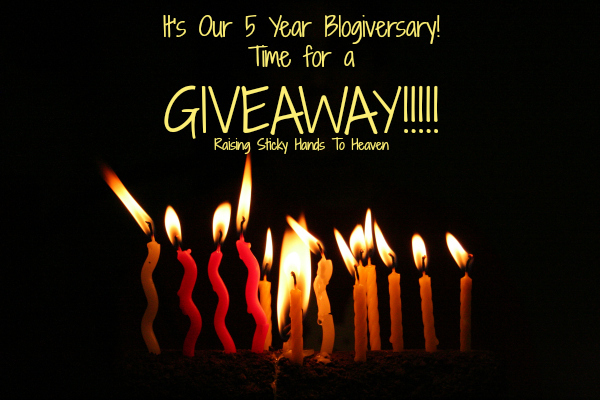 It’s Our 5 Year Blogiversary! Time For A GIVEAWAY!!! Happy birthday (well, last week) to us! In August of 2011, Raising Sticky Hands To Heaven launched. I can’t believe it has already been 5 years! So much has changed, but still the same… I love seeing what God is doing! We have a lot of big things coming up, and this year brought some exciting things as well. For example, have you joined Women On The Warpath? I think that is probably my favorite part of this blog ministry right now. We actually envisioned something very similar when we first began this blog. To see the dream God gave us at the beginning coming in to existence is exhilarating. Another dream God gave me a few years ago for Raising Sticky Hands To Heaven was a free online ladies retreat. I’m praying that this can all fall in to place soon. Would you be interested? Let me know! Alright, lets get to the giveaway… Time to celebrate! This giveaway is open to those who are age 18 and over residing in the US and Canada only. Writers for Raising Sticky Hands To Heaven and their immediate families are not eligible to enter. This promotion is in no way sponsored, endorsed or administered by, or associated with, Jitters Coffee or Amazon.com. We hereby release Jitters and Amazon.com of any liability. Winner will be announced in this blog post in a reply to their comment at, or soon after, 11pm pacific time after the giveaway ends. If the winner does not respond after 24 hours, a new winner will be picked. Please allow up to 6 weeks to receive your prize. RaisingStickyHands.com reserves the right, in its sole discretion to disqualify any person tampering with the entry process, the operation of the web site or otherwise in violation of these Official Rules. RaisingStickyHands.com further reserves the right, in its sole discretion, to cancel, terminate or modify this contest if the contest is compromised by virus, technical corruption, non-authorized human intervention, or any other causes which, in the sole discretion of the RaisingStickyHands.com, corrupt or affect the administration, security, fairness, proper play or integrity of the contest. RaisingStickyHands.com reserves the right in its sole discretion to disqualify any individual it believes has tampered with the entry process. In the event of cancellation or termination, RaisingStickyHands.com reserves the right to select the potential winner in a random drawing from among all eligible, non-suspect entries received prior to date of cancellation or termination. CAUTION: ANY ATTEMPT TO DELIBERATELY DAMAGE THE WEBSITE OR UNDERMINE THE LEGITIMATE OPERATION OF THIS contest IS A VIOLATION OF CRIMINAL AND CIVIL LAWS, AND SHOULD SUCH AN ATTEMPT BE MADE, RaisingStickyHands.com WILL DISQUALIFY ANY SUCH INDIVIDUAL AND RESERVES THE RIGHT TO SEEK DAMAGES (INCLUDING ATTORNEYS’ FEES) AND OTHER REMEDIES FROM ANY SUCH INDIVIDUAL TO THE FULLEST EXTENT PERMITTED BY LAW. If you have any additional questions – feel free to send us an email! Raising Sticky Hands To Heaven will not sell or use the photos or emails associated with this giveaway in any other way. GIVEAWAY! One Subscription For 1 Year To Miss Humblebee’s Academy! Have a preschooler that needs to be ready for Kindergarten? Want to be able to track their skills? Need their lessons to be portable? Look no further! Miss Humblebee’s Academy is here to the rescue! Now, you all already know how much my little boy, Johnny Ben, and I are in love with Miss Humblebee’s Academy because of the review I posted last week. But maybe your little one would love a chance to play with Miss Humblebee and her friends as well? Today we are posting this giveaway for (1) Subscription for 1 year to Miss Humble Bee’s Academy! It will end on May 7th at Midnight edt. The winner will be emailed and given 48 hours to respond, so be sure to check your email on Thursday morning! Without further ado, I present to you… The entry form. Have fun! Be sure to come back and tweet/pin each day for more entries. 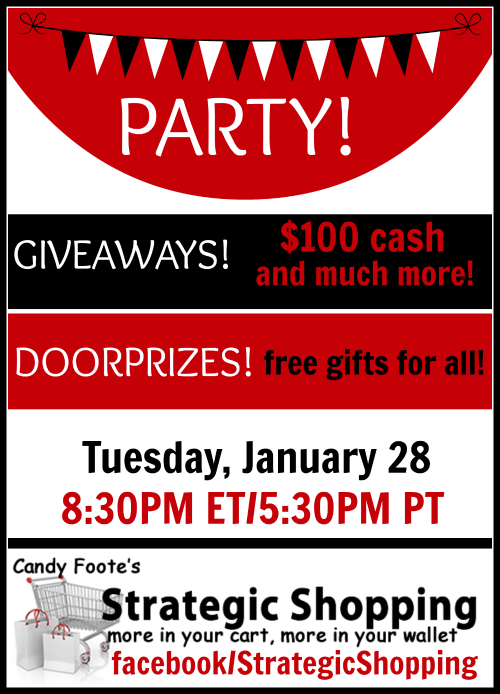 Strategic Shopping Facebook Party TONIGHT! This post contains affiliate links. By using these links to make a purchase you are supporting the expenses of our blog. Thank you! Are you looking for ways to save money? I know I am, for sure! One way I’m starting the year off right is by following some of the advice in Candy Foote’s books Strategic Shopping & Christmas with Strategic Shopping to save some money for our family. I’ve been blessed to be on the launch team for the re-release for Strategic Shopping & the release of the brand new follow up book, Christmas with Strategic Shopping! I’ll be posting a review some time this week, but I can tell you right now that these books are really neat and would be a great addition to your own ebook library. Today I want to tell you about the Facebook party we are having tonight! There will be lots of prizes, tips, and fun! I really hope that you can join us. You won’t regret it! Be sure to “Like” the Facebook pages listed in this post so that you can join in on the fun, and don’t forget to RSVP! Who’s ready to party, save some $$$, and win some awesome prizes? Candy Foote is celebrating the release of her new book, Christmas with Strategic Shopping and the re-release (with a new low price!) of Strategic Shopping, with what looks to be a rockin’ Facebook Party! Here are some of the prizes you could win! Build a Menu: She will be giving away a one-year membership to this awesome, money-saving meal planning program. In three easy steps you can select the store you like to shop at, pick your recipes and print your customized shopping list. You’re done menu planning for the week! To learn more about Build a Menu, go here. 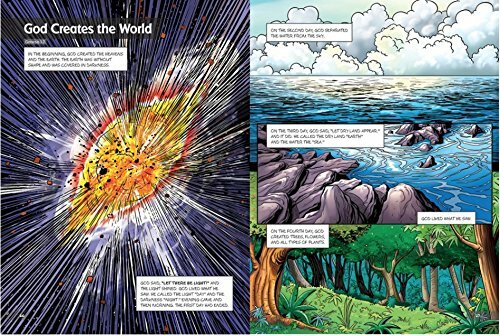 Molly Green Magzine/Econobusters has donated for 2 giveaways during Tuesday’s party– (3) one-year memberships to Molly Green Magazine, which includes future issues as well as back issues, as well as a bundle of 5 eBooks! Total Value of these giveaways is more than $265! To learn more about Econobusters with Molly Green, go here. Did I mention that one of you could win more than $100 in Paypal Cash or an Amazon Gift Card (winner’s choice)? 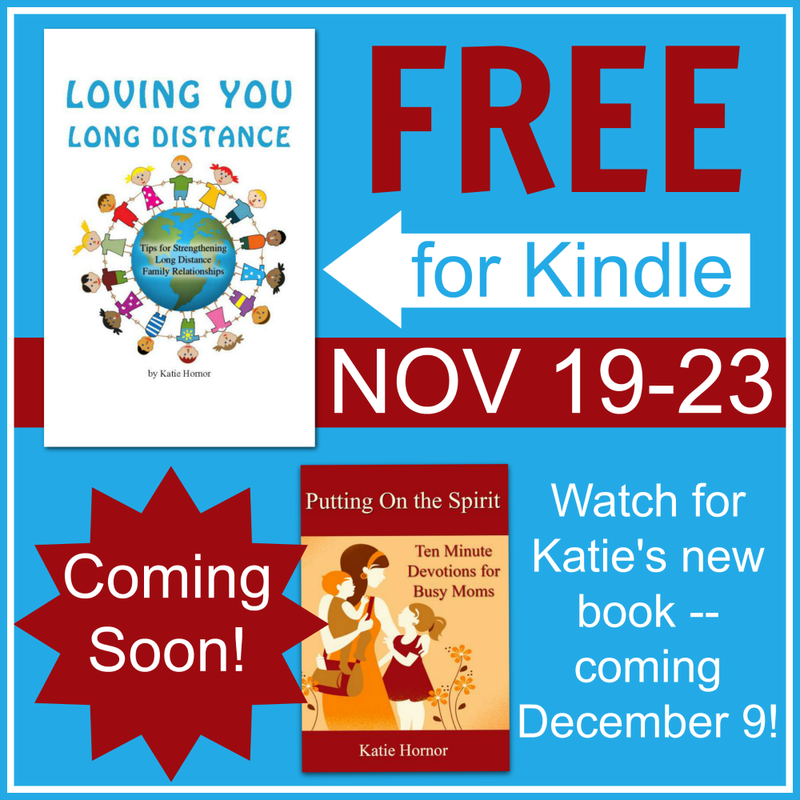 There’s also an awesome bundle of ebooks up for grabs, from wonderful folks at Hal & Melanie Young, Phyllis Sather, and Tabitha Philen. Not to mention Candy’s books! So, what exactly is a Facebook party? It’s a fast-paced, fun-filled hour and a half where Candy will be answering your Strategic Shopping questions, asking you some fun trivia questions, and best of all, giving out prizes. Everyone who attends the party will receive FREEBIES just for showing up! Your first step is to RSVP on the events page over here. The actual party will not be on the events page though. It will be on Candy’s STRATEGIC SHOPPING page. Throughout the party, watch for new status posts every 5 minutes with trivia questions, giveaway offers, and more fun. Leave comments, ask questions, and have fun! Refresh the page often so you don’t miss out on new posts! Spontaneous New Year’s Eve Giveaway! While I’m sitting here with a few hours to spare on the West Coast, I realize that all of those on the East Coast are about to ring in 2014 within the hour and can’t help but wonder: Where did this year go? Do you feel the same way? Quite a whirlwind! As much as I wish I could give each of you sitting at home tonight a gift to help bless your New Year, I’m going to have to narrow it down to just one. However, I’m going to make this really easy. One winner will be receiving a $20 gift card to Amazon.com! All you have to do is leave a comment with what you are looking forward to the most in 2014! If you’d like a bonus entry, you can sign up for our email subscription up in the right hand sidebar. If you do sign up for email delivery though, come back and leave another comment with the name you used to sign up though so you get an entry. This giveaway will be ending in just a few hours, at 2am pacific time on January 1st, 2014. May God richly bless each and every one of you this year! This giveaway is open to those who are age 18 and over residing in the US only. Writers for Raising Sticky Hands To Heaven, their immediate families, and current Amazon.com employees are not eligible to enter. This promotion is in no way sponsored, endorsed or administered by, or associated with, Amazon.com. We hereby release Amazon.com of any liability. Winner will be announced in this blog post in a reply to their comment at, or soon after, 2am pacific time after the giveaway ends. If the winner does not respond after 24 hours, a new winner will be picked. Please allow up to 2 weeks to receive your prize. RaisingStickyHands.com reserves the right, in its sole discretion to disqualify any person tampering with the entry process, the operation of the web site or otherwise in violation of these Official Rules. RaisingStickyHands.com further reserves the right, in its sole discretion, to cancel, terminate or modify this contest if the contest is compromised by virus, technical corruption, non-authorized human intervention, or any other causes which, in the sole discretion of the RaisingStickyHands.com, corrupt or affect the administration, security, fairness, proper play or integrity of the contest. RaisingStickyHands.com reserves the right in its sole discretion to disqualify any individual it believes has tampered with the entry process. In the event of cancellation or termination, RaisingStickyHands.com reserves the right to select the potential winner in a random drawing from among all eligible, non-suspect entries received prior to date of cancellation or termination. CAUTION: ANY ATTEMPT TO DELIBERATELY DAMAGE THE WEBSITE OR UNDERMINE THE LEGITIMATE OPERATION OF THIS contest IS A VIOLATION OF CRIMINAL AND CIVIL LAWS, AND SHOULD SUCH AN ATTEMPT BE MADE, RaisingStickyHands.com WILL DISQUALIFY ANY SUCH INDIVIDUAL AND RESERVES THE RIGHT TO SEEK DAMAGES (INCLUDING ATTORNEYS’ FEES) AND OTHER REMEDIES FROM ANY SUCH INDIVIDUAL TO THE FULLEST EXTENT PERMITTED BY LAW. If you have any additional questions – feel free to send us an email! Raising Sticky Hands To Heaven will not sell or use the photos or emails associated with this giveaway in any other way. Are You A Busy Mom In Need Of Encouragement? Enter This Giveaway! As you all know by many of my posts, Facebook statuses, tweets, and the theme of this blog, I am a very VERY busy mom. I know all of you are too. It makes finding alone time with Jesus a challenge most days, doesn’t it? I have realized that I have become “picky” and “choosy” about what I spend my time reading because of my time with God being so hard to come by. Have you as well? You don’t want to spend time reading a study or devotional that is watered down or sleep inducing, but something meaty and nourishing that makes your time worth while and leaves you feeling fed? The last few weeks I have been reading an amazing devotional book for busy moms. 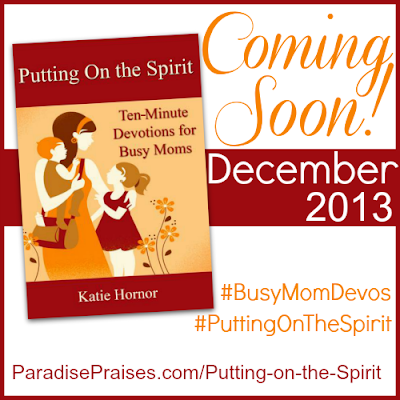 I’m on the launch team for this book, Putting On The Spirit: Ten Minute Devotions for Busy Moms by Katie Hornor, and I am so excited for it’s release on December 9th so that you can all read it for yourselves. It has blessed me so much and has challenged me to grow in the Lord. 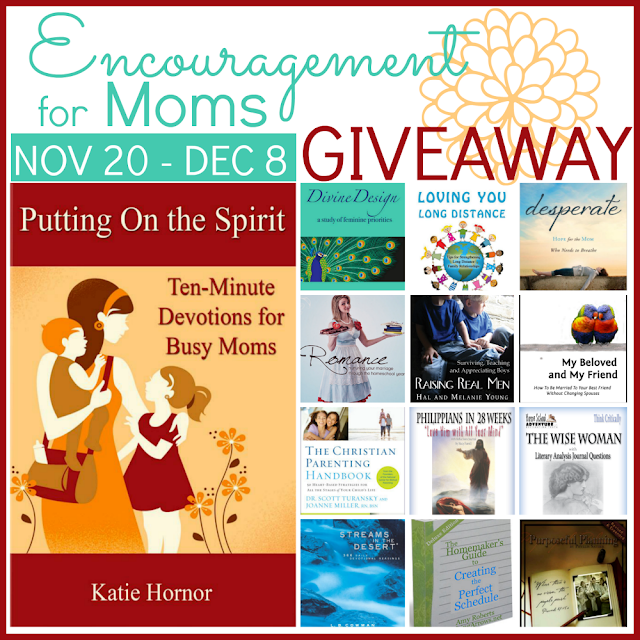 The Putting on the Spirit Launch Team is excited to help Katie celebrate the release of her new book with a special giveaway of books that will encourage, equip, and inspire any mom. 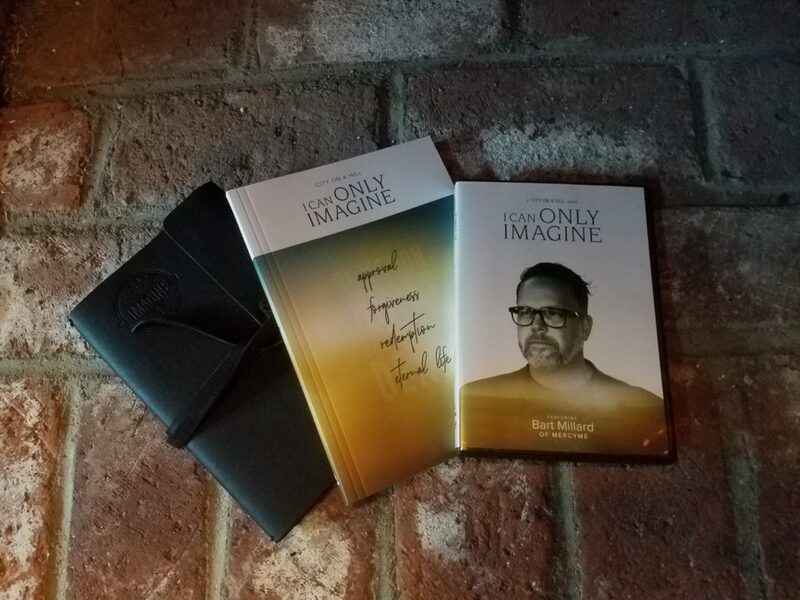 One winner will win all of the books listed below (a $120 value), plus 3 more winners will win a digital copy of Putting on the Spirit. We would like to thank the following friends for their generous sponsorship of this giveaway! Be sure to stop by their websites to say thank you! To enter the giveaway, use the Rafflecopter at the bottom of this post. One winner will be selected and announced by noon ET on December 13, 2013. U.S. residents age 18 and older only please. Other Terms and Conditions can be found in the Rafflecopter. 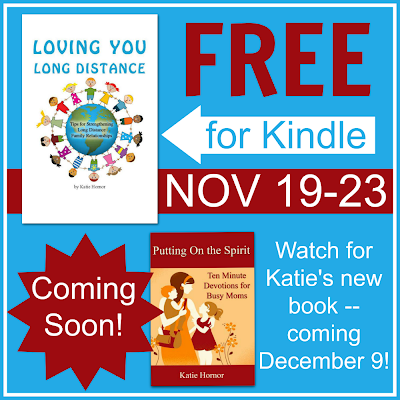 In addition to this great giveaway, Katie is offering her book, Loving You Long Distance, free for Kindle for 5 days — November 19-23. Be sure to click over and grab that one after you enter the giveaway! God bless! This is an awesome giveaway. So excited for whoever wins!